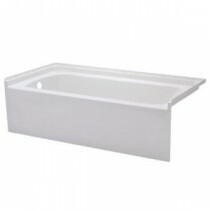 Delivering a sleek, ergonomic design, this Ensemble bath provides maximum soaking comfort providing lumbar support and a deep bathing well. Made from STERLING's exclusive Vikrell material for durability. Comes with a Commercial three year limited warranty and Residential ten year limited warranty. Can be installed with wall set 71374100.